WASHINGTON -- US President Donald Trump said Thursday that he looks forward to meeting with Russian President Vladimir Putin a second time to continue their work on North Korea and other global issues. 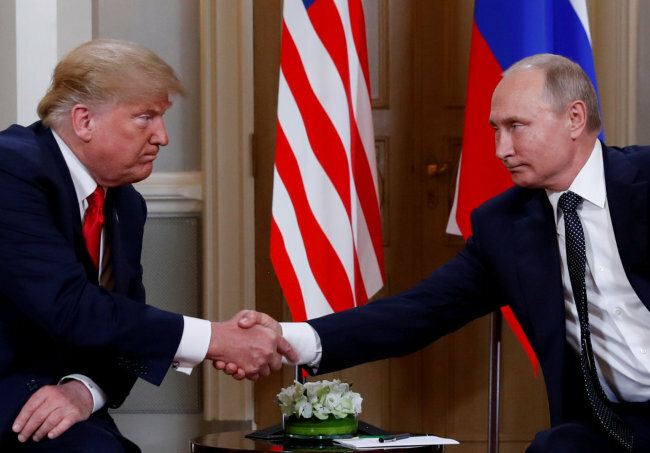 Trump and Putin held their first summit in Helsinki this week amid tensions over alleged Russian meddling in the 2016 US presidential election. Trump has drawn flak for appearing to side with Putin over US intelligence agencies' assessment that implies Russia tried to sway the vote in his favor. In a fresh tweet attacking the media for its negative coverage of the summit, the US president claimed the two leaders had many issues they could work together on. "I look forward to our second meeting so that we can start implementing some of the many things discussed, including stopping terrorism, security for Israel, nuclear proliferation, cyber attacks, trade, Ukraine, Middle East peace, North Korea and more," he wrote. "There are many answers, some easy and some hard, to these problems ... but they can ALL be solved! The need for North Korea to remove its nuclear weapons was a major topic of discussion during the summit, Trump said earlier. "Russia has assured us of its support. President Putin said he agrees with me 100 percent, and they'll do whatever they have to do to try and make it happen," he said Tuesday. But Trump also backed away from setting a deadline for North Korea's denuclearization, saying, "We have no time limit. We have no speed limit. We're just going through the process."